ROCHESTER, N.Y., Jan. 5, 2018 /PRNewswire/ -- Vuzix® Corporation (VUZI), ("Vuzix" or the "Company"), a leading supplier of Smart Glasses and Augmented Reality (AR) technologies for the consumer and enterprise markets, is pleased to announce the official unveiling of the Vuzix Blade™, which was awarded four International CES Innovation 2018 awards in the areas of Fitness, Sports and Biotech; Wireless Handset Accessories; Portable Media Players and Accessories as well as Computer Accessories. Today Vuzix released its latest video on the Vuzix Blade™ AR Smart Glasses which can be seen on the Vuzix YouTube channel. Certain statements contained in this news release are "forward-looking statements" within the meaning of the Securities Litigation Reform Act of 1995 and applicable Canadian securities laws. 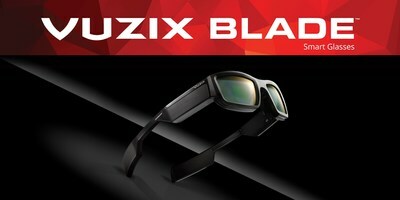 Forward looking statements contained in this release relate to the new Vuzix Blade product and its technology demonstrations at CES, the advancements of Vuzix products, and among other things the Company's leadership in the Smart Glasses and AR display industry. They are generally identified by words such as "believes," "may," "expects," "anticipates," "should" and similar expressions. Readers should not place undue reliance on such forward-looking statements, which are based upon the Company's beliefs and assumptions as of the date of this release. The Company's actual results could differ materially due to risk factors and other items described in more detail in the "Risk Factors" section of the Company's Annual Reports and MD&A filed with the United States Securities and Exchange Commission and applicable Canadian securities regulators (copies of which may be obtained at www.sedar.com or www.sec.gov). Subsequent events and developments may cause these forward-looking statements to change. The Company specifically disclaims any obligation or intention to update or revise these forward-looking statements as a result of changed events or circumstances that occur after the date of this release, except as required by applicable law.